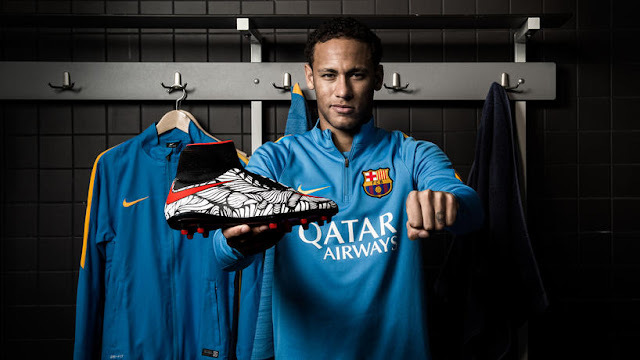 ::: ChiefChapree.NET :::: [Swoosh]: Ousadia Alegria - Yet Another Special Edition Nike Hypervenom II Boots For Neymar Jr.
"Ousadia" and "Alegria" which means "daring" and "joy" are apparently part of Neymar's life motto and were actually tattooed on his hands. 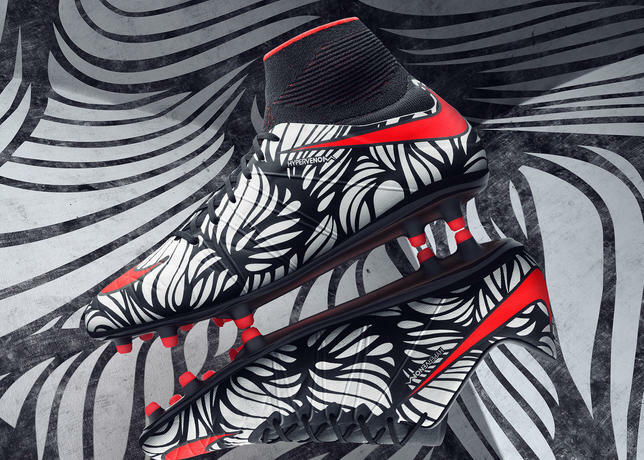 Bruno Carneiro Mosciaro a.k.a Bruno Big, who has previously worked on Brazil's kit for World Cup 2014 then came out with two artworks to represent each words and also became the very design that covered the Hypervenom II boots within the new collection. Apart from the Phantom variation, there are also two other versions of Hypervenom II in the Ousadia Alegria collection: the low cut Phinish for folks that are not fond of the Dynamic Fit Collar, and indoor-oriented Proximo IC for futsal/street players out there. In conjunction with the launch, Bruno Big has custom painted 1,000 shoeboxes for the boots with one of them goes to Neymar first (obviously). While you can apparently get your hands on the remaining 999 pairs through Nike Football app on 31 January...which means a problem for us Malaysians since Nike US store doesn't officially ship to Malaysia. Hence, information on availability or price for the Ousadia Alegria collection in Malaysia is not known at the moment but will certainly keep you footie fans updated through this site, my Instagram, or Twitter if I heard more news about it or I spot them at retail stores.